Is the gamble feature on pokies profitable? The gamble feature (and variations of it) is utilised within many casino games, predominantly in online and real life pokies games, making it one of the most commonly played side games. Unlike in traditional pokies, the odds of the gamble feature are not in favour of the house, but completely balanced, providing players with a good chance to win real money. We explore the gamble feature in further detail to help players understand how they stand to profit from this bonus feature when playing online pokies. What is the gamble feature on pokies games? Game of Thrones – One of Microgaming’s most played pokies titles, The Game of Thrones 243 ways video slot, boasts a traditional gamble feature, but adds its own unique flavour. After all wins within the base game, you have the option of selecting the gamble feature, which will give you the shot at doubling, tripling and quadrupling your original winnings. The feature displays a trail map which consists of four stages, each guarded by a character: the three-eyed raven, the White Walker, the direwolf and the dragon. Begin at the three-eyed raven and choose either heads or tails for the coin flip. Guess correctly, and you will move on to the next stage. You have the option to collect your winnings following each successful choice, but if you guess incorrectly, you will lose all your winnings. You can gamble until the trail map is complete. Each correct guess will double your wins from the previous stage. Individually, each flip of the coin provides the player with a genuine 50/50 shot at doubling their win – an even-money game which is very rare within any kind of casino. However, if you calculate your odds from the very beginning of the gamble feature, then you own a 6.25 per cent chance at guessing the right coin side four times in a row (0.5 x 0.5 x 0.5 x 0.5 x 100). Obviously, with every correct guess, those odds grow in your favour, so play wisely. 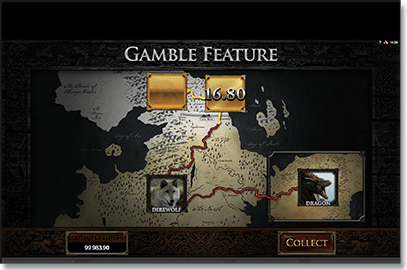 The Game of Thrones example above is a more intricate, unique take on the gamble feature, but many online pokies continue to offer the tradition gamble bonus which is much less complex. 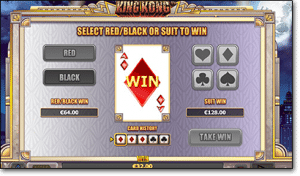 Many classic online video slots incorporate one of the most commonly used gamble features; the black or red card, and the hearts, diamonds, clubs or spades card. After a win, players can opt to play this gamble feature, and choose between doubling their win or quadrupling their win. To double your win, guess whether the card will either be coloured red or black. Like the coin flip, this is a genuine 50/50 guess. If you want to attempt to quadruple your winnings, you should guess what specific suit the card will be. Here you have a one in four chance of guessing correctly (25 per cent odds). Again, if you calculate your odds from the very beginning of the game, then you have a 0.39 per cent chance of guessing the correct suit four consecutive times (0.25 x 0.25 x 0.25 x 0.25 x 100). But prior to each individual guess, your odds remain one in four. You can collect your winnings after any correct guess. Typically, with card gamble features, you can gamble until your heart is content; just don’t get too greedy. Games such as video poker also utilise the gamble feature, along with other casino smaller casino titles, like some scratch cards. So long as there is an option to double your money, or in some cases quadruple your winnings, coupled with completely unbiased odds, the gamble feature can be said to be in effect. If you opt to play the feature, it is one of the smarter bets you can make in any casino game, due to the nature of the balanced odds. So, as for the question as to whether the gamble feature is profitable, the answer is yes. The gamble feature can certainly be profitable, but to benefit from it you just need to make the right call as to when you think your luck will run out. While doubling your wins will leave you clicking your heels with joy, the disappointment when you lose your recent win can leave you with deep regrets. Always gamble responsibly, never chase your losses, and quit while you’re ahead. Give the gamble feature a go at Raging Bull Casino, our top-rated casino site for players from United States, which has hundreds of real money casino games to choose from, with no downloads required.